In those days we were at two international exhibitions in Vilnius. We presented three females (Niagara, Kiki and Didi). 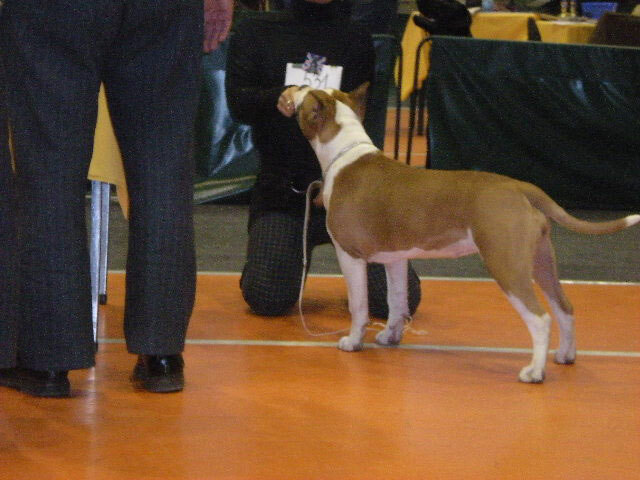 Niagara was twice best Junior, and Kiki in the second day won puppy class, and came to the final on bis. At the National exhibition Kiki was the best puppy in breed in puppy class and Niagara was the best junior in breed in junior class. At today's exhibition Niagara got Junior Winner and thus won the JUNIOR CROATIA CHAMPION, JUNIOR CENTRAL ∧ EAST EUROPE WINNER, and JUNIOR ZAGREB WINNER titles. AST Kiki got 2nd place and Kazo BOB. 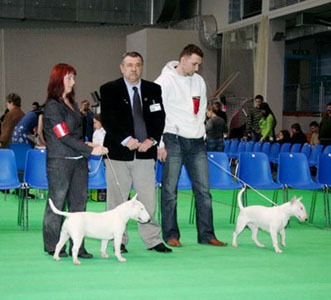 On first international exhibition in Zagreb Niagara was the Best Junior with appointment of a CRUFTS, Kiki second place with Very Promising assessment, and KAZZO from our kennel living in Croatia won the race and also was nominated for a CRUFTS. 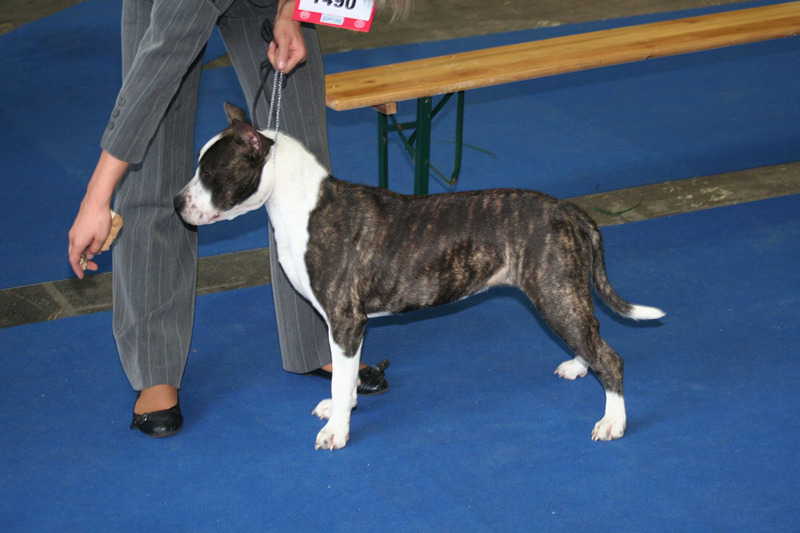 On this day, our youngest amstaff Kiki debut in the juniors at the AST club exhibition in Zagreb. 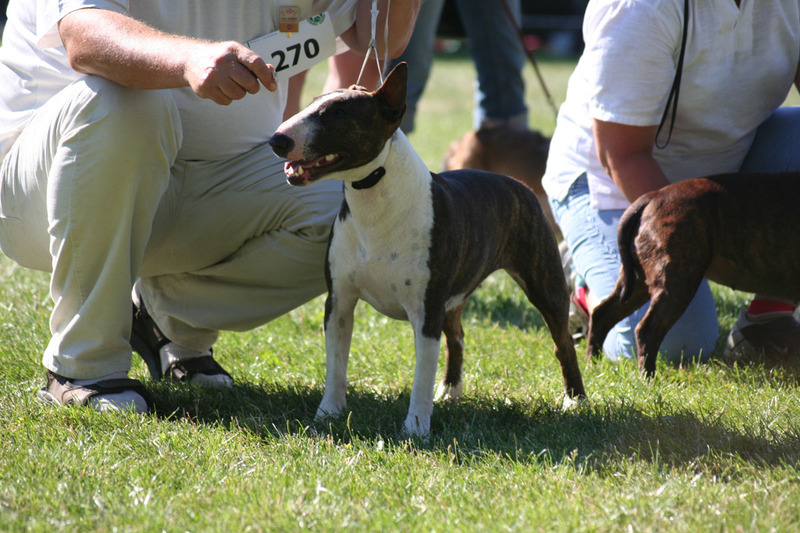 She received a very good description, note "very promising" and took 1st place among the puppies. 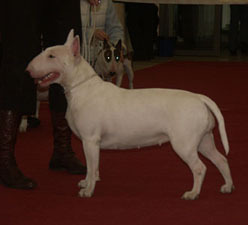 At today's International Exhibition of dogs in Poznan Lord was the best miniature bullterrier. He won the race and earned a POLAND WINNER 2008 title. 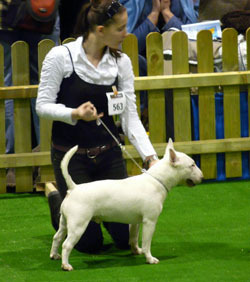 Buster debuted in Cyprus in the Champion class. On first day he took the first place r.CAC and r.CACIB, and on the second day CAC i r.CACIB. Thank you Demetris for taking care for our loved Buster. At the club show Lord got 2nd place. Didi and Niagara like on European exhibition. 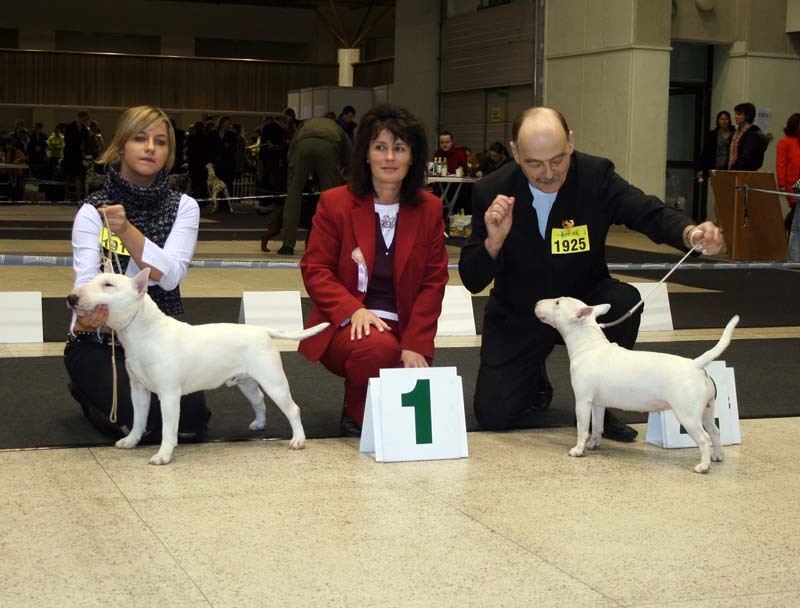 At the European exhibition we drove with three dogs: in minis Lord won Open class; Niagara in Junior class with perfect note and Didi in Puppie class with very promising were outside the the podium. 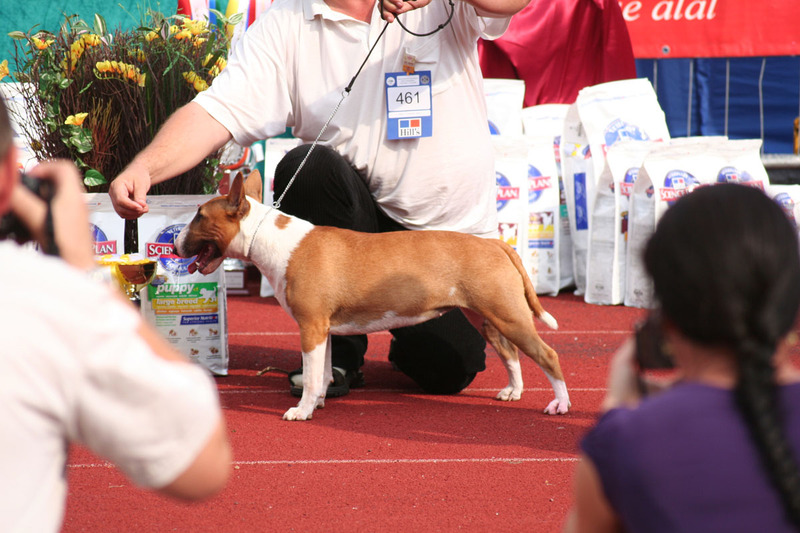 Our two female dogs Heidy and Niagara have carried huge progress on two shows in Leipzig. 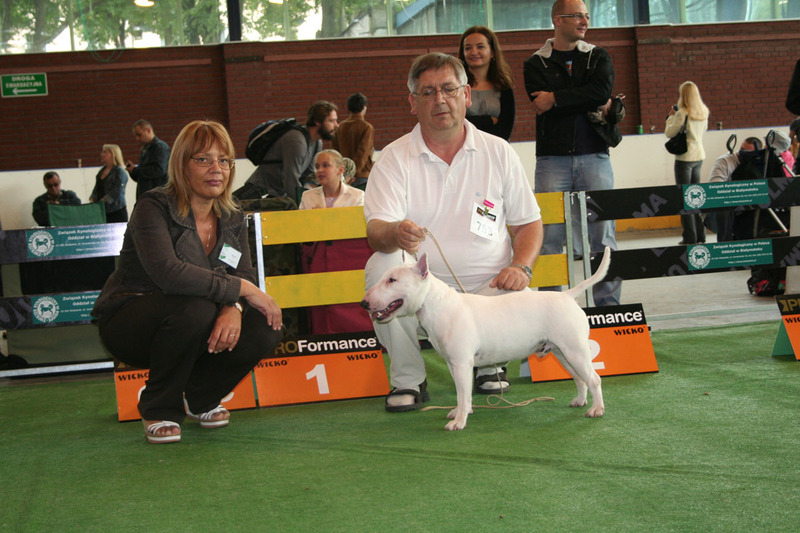 Heidy won twice bred (BOB), and finished GERMANY CHAMPION and GERMANY CLUB CHAMPION. She got too LEIPZIG WINNER 2008. Niagara won twice Junior Class making debut in Juniors and became JUNIOR GERMANY CLUB CHAMPION 2008 and JUNIOR LEIPZIG WINNER 2008. 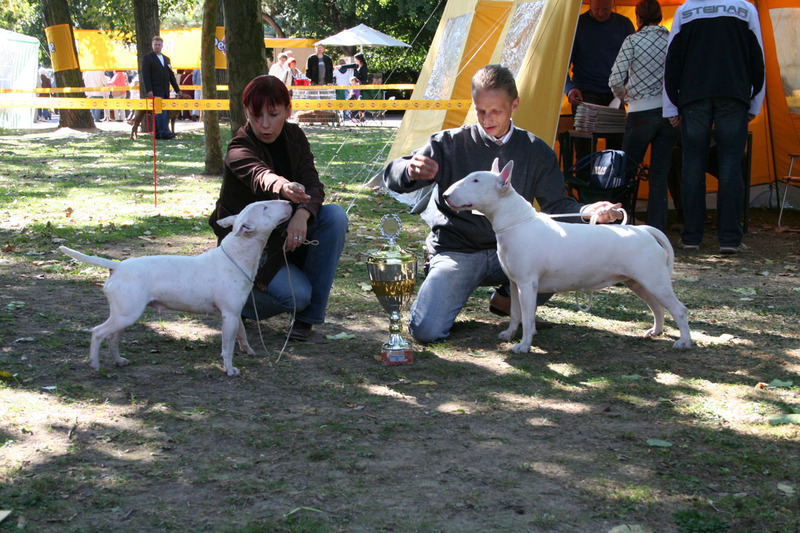 Our two guys Buster and Lord yesterday got rights to POLAND CHAMPION title. 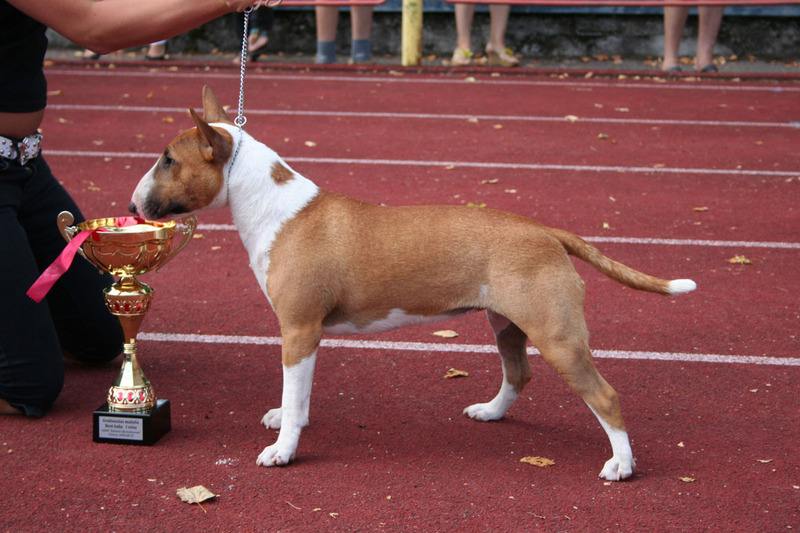 Lord won race in minis and Buster was the best dog of standard bullterriers. Far expedition to Estonia was very successful. 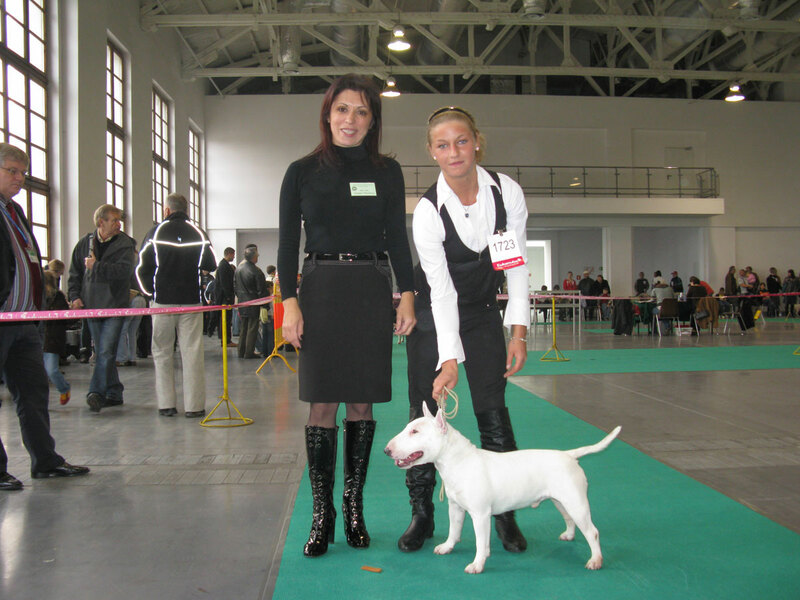 Heidy returns with ESTONIA CHAMPION, and Niagara with 3rd place on BIS Puppu. Lord got CACIB and BOS. In this day was "BALTASIS DZENTELMENAS" club show. 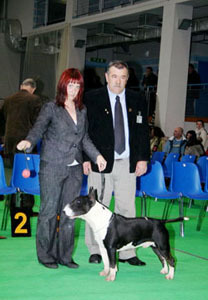 Heidy again was BOS and got "BALTIC TERRIER-WINNER 2008" and "CLUB WINNER 2008" titles. Niagara again with V.P. won Puppy Class and was BIS Puppy 4. 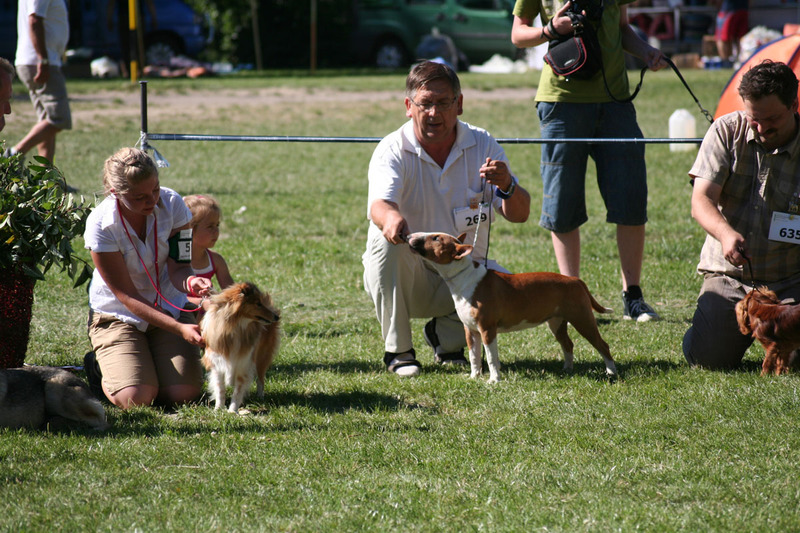 In this day was club show "BALTIJOS TERJERAS 2008". Heidy was BOS and got , and Niagara with V.P. won Puppy Class and was BEST Puppy, BIS Puppy 1. On international show "VILNIUS SUMMER 2008" Heidy got very goot note and Niagara got very promising 2.
International show "VILNIUS SUMMER 2008" were in in Vilnius at this day. 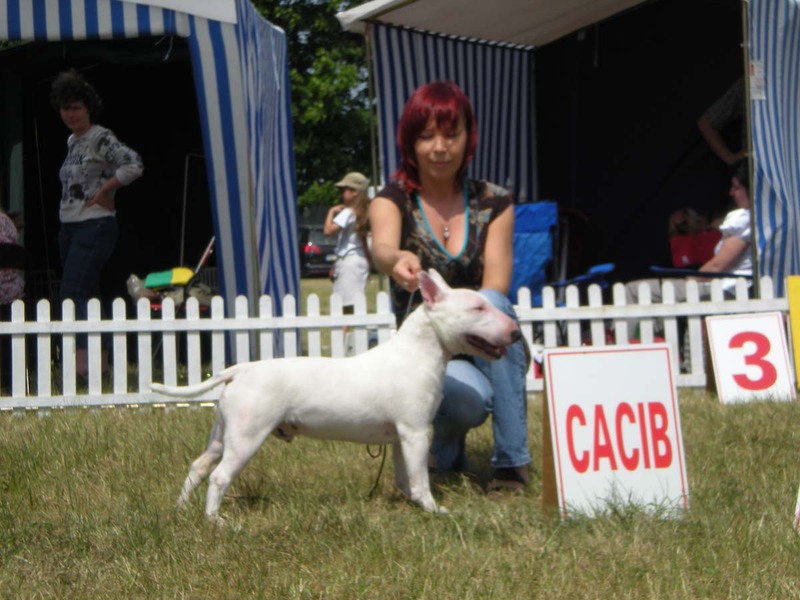 Heidy won bred (CAC, CACIB, BOB) and became INTERCHAMION. This is oure 6th interchampion title. She got also LITHUANIA CHAMPION title on this show. 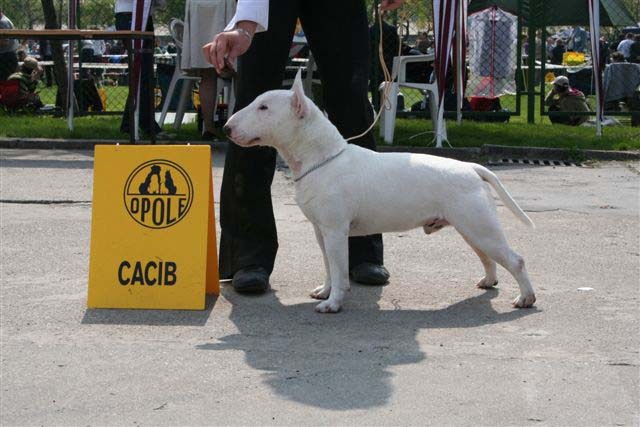 Kayah won bred with excelent note in Chojnice. Niagara v.p. in Puppy Class and in final 6 on BIS. 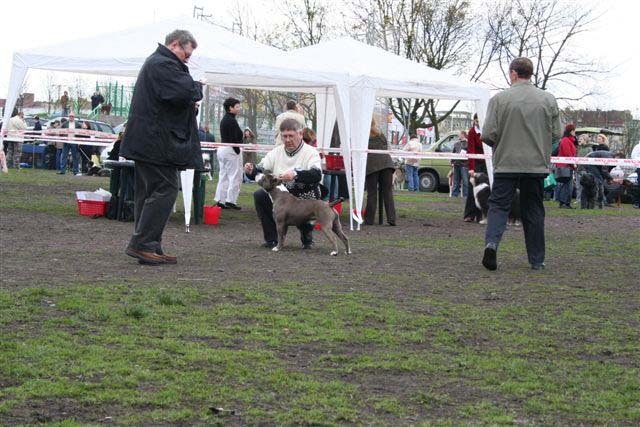 First Niagara's show in puppy class and great result V.P 1 place, BIS PUPPY I (most beautiful puppy in show). 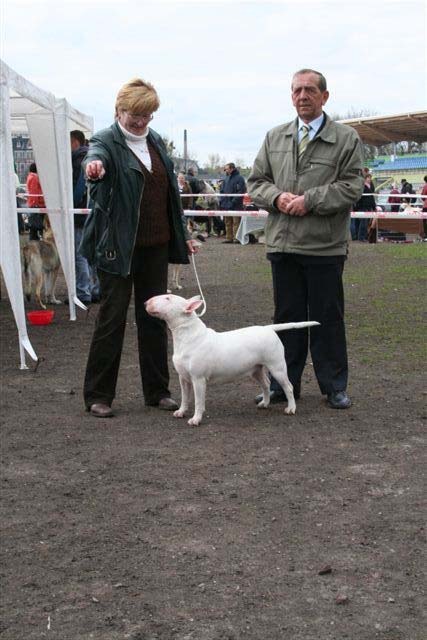 Kayah - Junior Winner (she finished Junior Poland Champion), BoB, BIS TYP BULL II place, BIS JUNIOR 2 place. Killer Piggy - CWC, BoS. 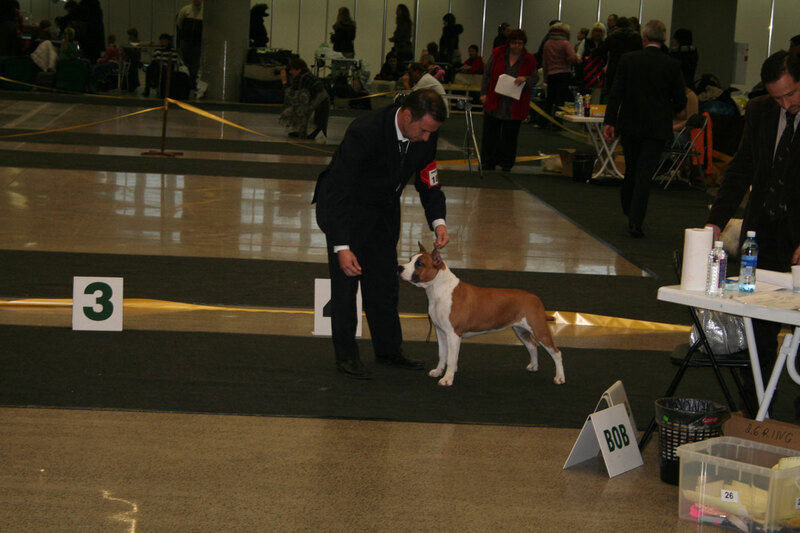 It was first Piggy's international show in intermediate class and first CACIB. Today Piggy finished Junior Poland Champion, wining Juniors. She was third on BIS Junior. Congratulations Gosia. 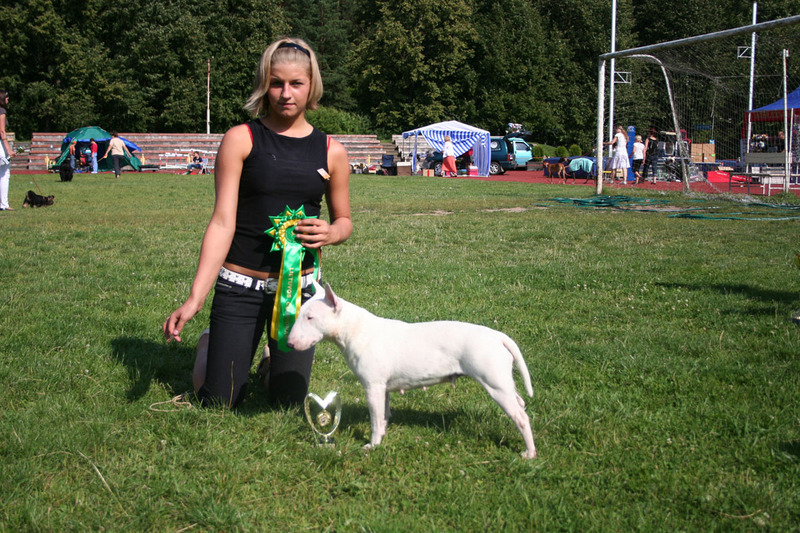 Kayah won Junior Class and became BEST Junior in Lubieszyn. Yearly BULLIADA has proceeded today. 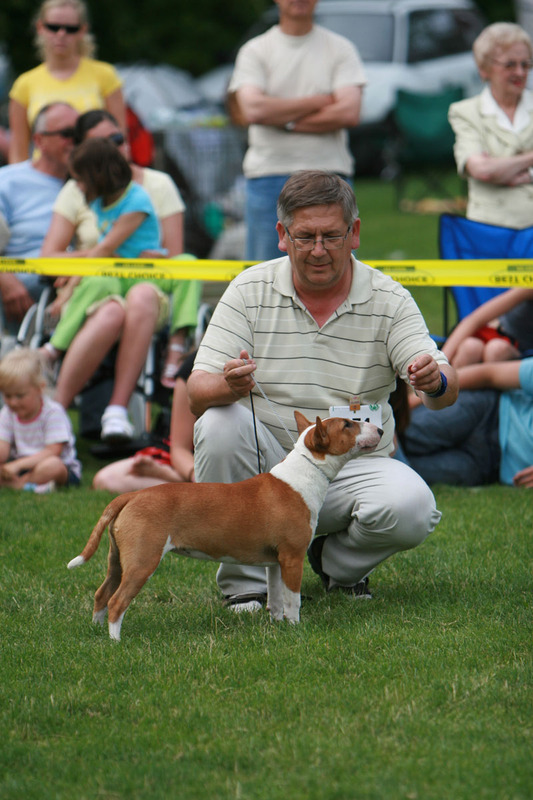 Attendance has added - near 130 bullterriers. We did not expose oure dogs, because we were engaged at organization. As usual Leszno was lucky for us. In this year BoB for Lord. 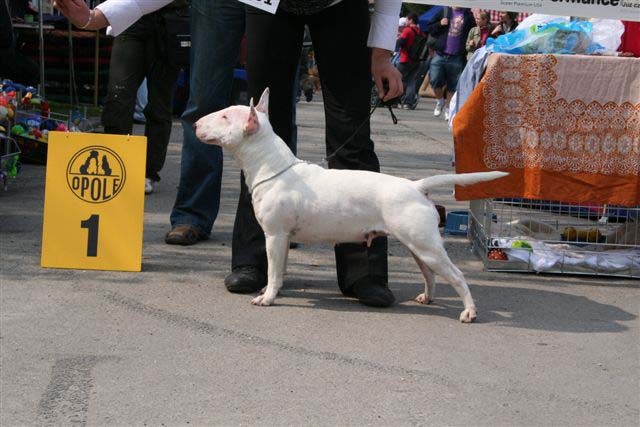 (like SPIKE in 2007) .Iris on 3 place in Open Class. On international exhibition in Opole Lord got BOS, CACIB, and Heidy CAC, rCACIB. Big progress IRIS. Beautiful exposed by Ewa Iris won race (BOB) and group (BOG I). Heidy finished POLAND CHAMPION winning race (BOB). Lucky from our kenel become Best Junior in race, and on BIS Junior has been chosen to 3 best in group III. Congratulations Jacek. 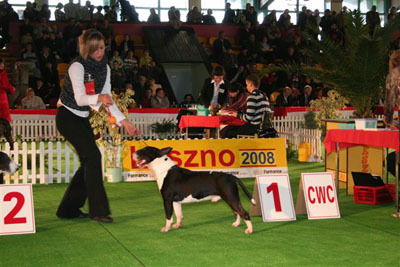 On international exhibition in Katowice Buster received second appointment on CRUFTS 2009 - winning race (BOB). Lord this time got CWC and rCACIB. 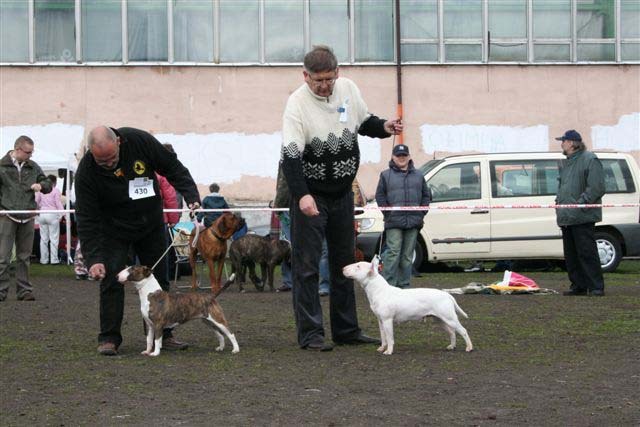 On club exhibition Lord got the title "Winner of Lithuania Terrier Club 2008". 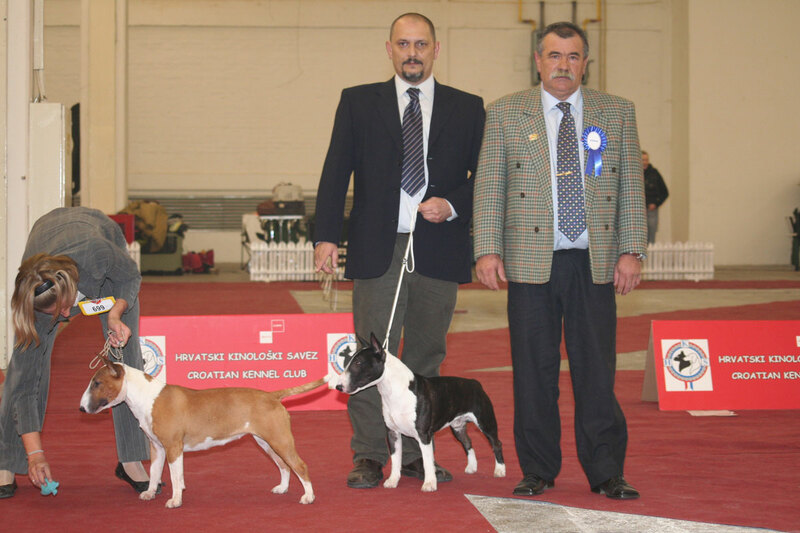 On international exhibition Lord again won race (BOB), and Buster rCACIB. In first day Lord (CACIB, BOB), and Buster (CACIB). 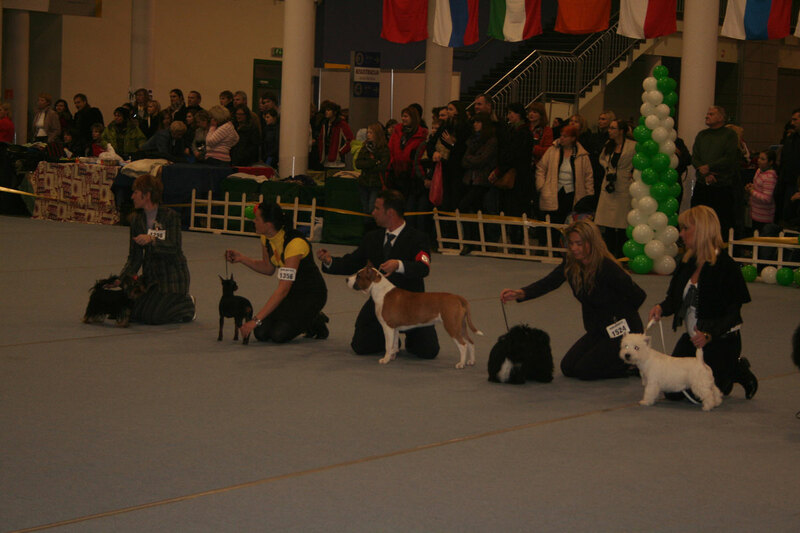 They got appointment on CRUFTS 2009. 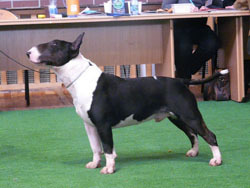 Buster became the best bullterrier on Champions exhibition in Leszno (BOB). 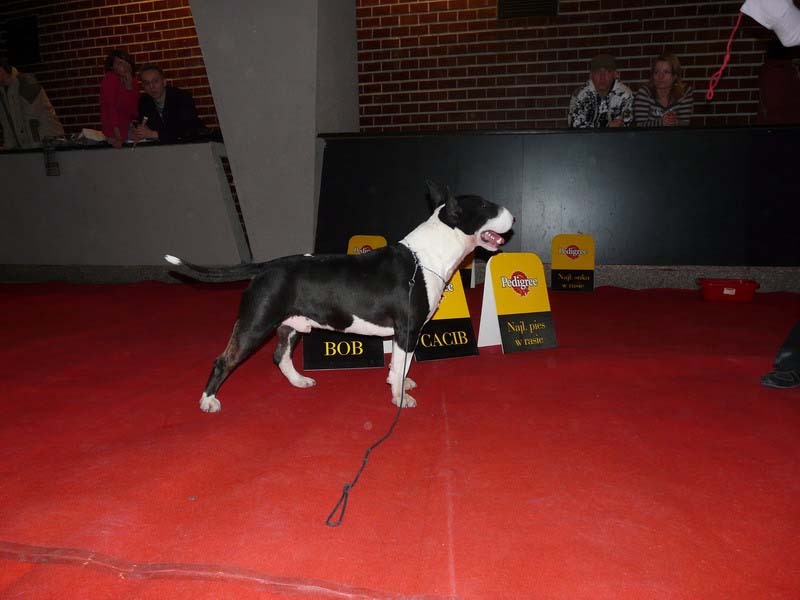 After long pause Eve beautifull shew Iris (Fendi), which won race (BOB) and was third in group (BOG III). This super result is my wife's Eve contribution, which dedicated a lot of time on Fendi preparation, which has been at us for 3 weeks. Buster became the best adult dog, lost race comparison with Fendi, and Lord traditionally (BOB). Buster and Lord first time in intermediate class. 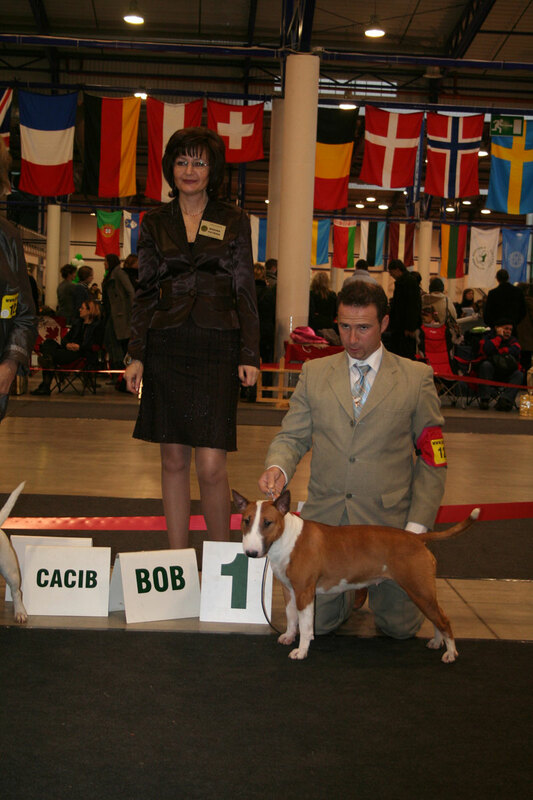 Lord started adult Champion winning (CWC) and Interchampion winning (CACIB), and won race (BOB). Buster won (CWC) and (CACIB). 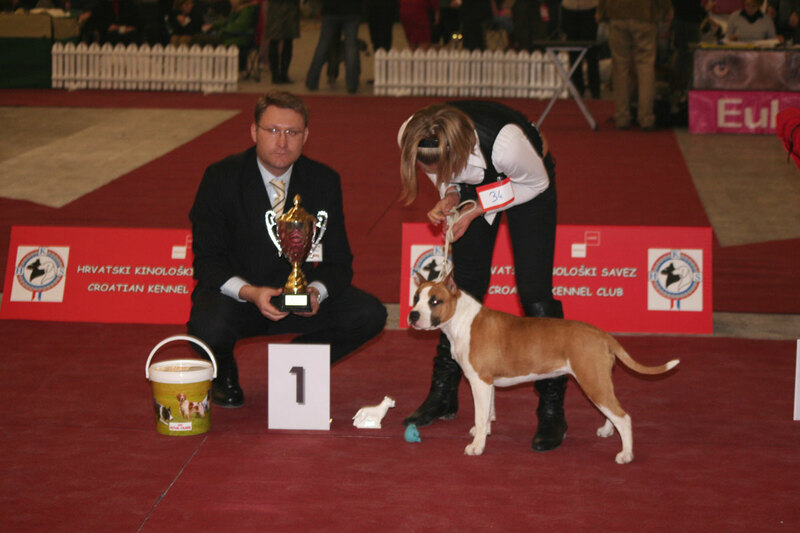 Kayah first time in junior class got Junior Winner and Best Junior in Breed. 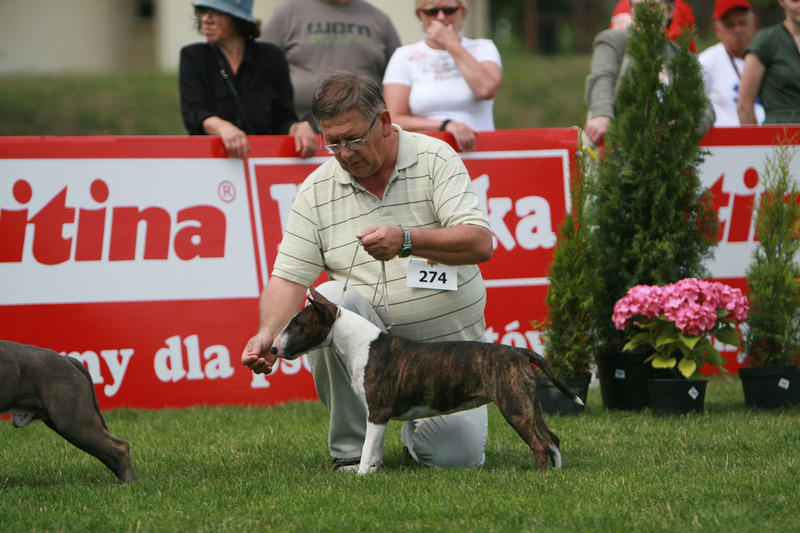 Jolly Ewimark Rakownia (Sisy's and Spike's daughter) finished Polish Champion and started Interchampion, after geting (CWC) and (CACIB). Big congratulations for Mariusz. 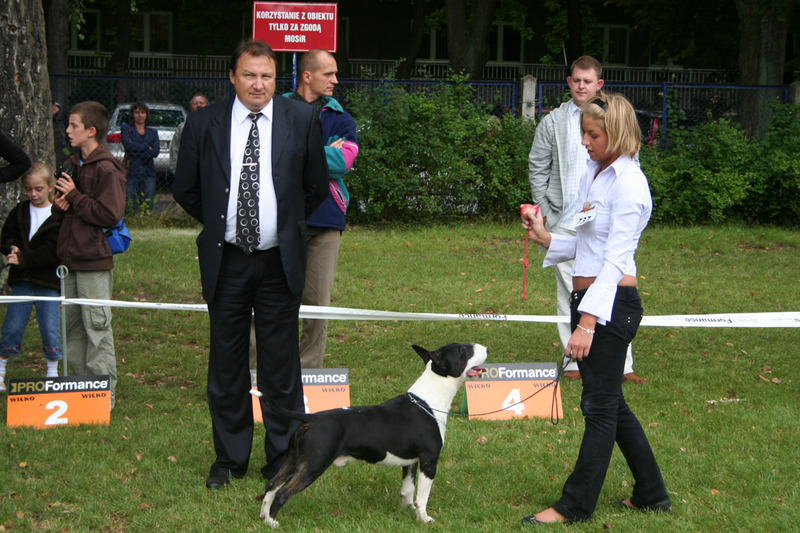 Today begun exhibition season 2008 in Głogów - Lord won (NJ) and (BOB), Piggy Winner of Junior Class, and Buster and Larry 3rd place with perfect opinion.